Masticating juicers are often referred to as cold press juicers or slow juicers. This category of juicers includes some the best juicers available. We’ll cover lots of important information for making a decision, including what cold pressed means and why you might choose a masticating juicer over a centrifugal juicer. 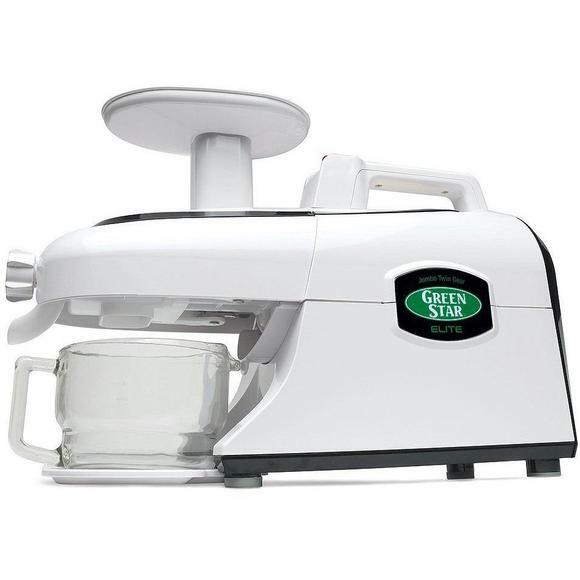 You may have heard of the Tribest Greenstar juicer, the Omega Cold Press juicer, or even the Super Angel Juicer, which are some the most trusted brands available. But we’ll cover the top nine best juicers to buy. It’s helpful to note that there are two different types of masticating juicers: single auger and twin gear (considered a high-end juicer). We’ll focus mainly on single gear cold press juicers, then take a look at our favorite twin gear juicers and who should consider purchasing one of those. Welcome to our official guide of the best masticating juicers in 2019. 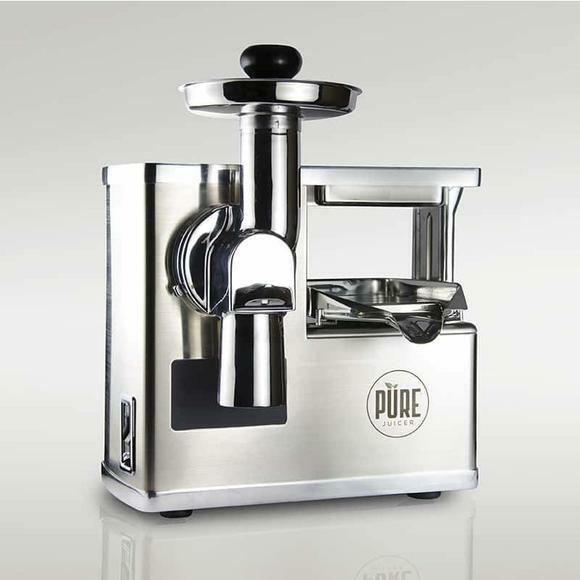 Masticating juicers have many names: cold press, single gear, single auger, and slow juicer. But how a masticating juicer does its job (regardless of the name) is the same across the board. Masticating juicers use a central gear (or gears) to “chew up” the fruits and vegetables, making them highly efficient machines that get 15-20% more juice from produce than your classic centrifugal juicers. 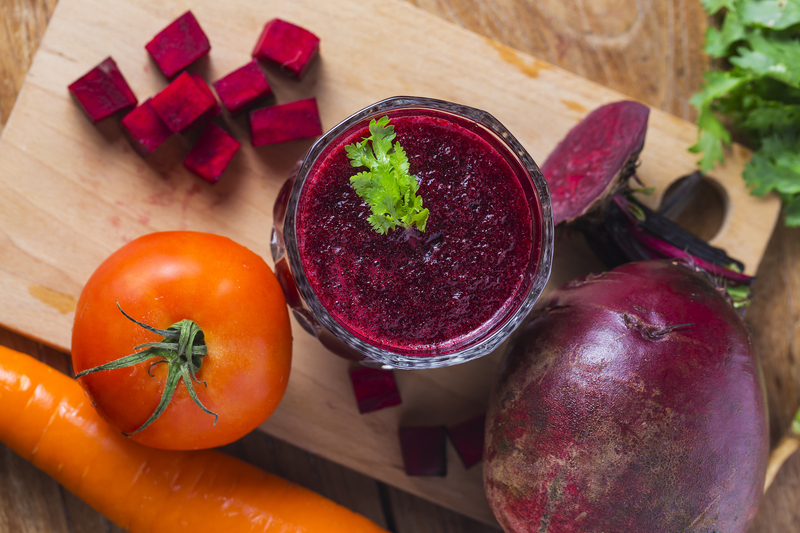 While they are generally more expensive than centrifugal juicers, many users feel they save money because of needing less produce to get the same amount of juice. When it comes to juicing leafy greens, wheatgrass, sprouts, and other hard-to-juice produce, a masticating juicer is the ideal way to go. Masticating juicers also operate slower, which means heat doesn’t build up when juicing fruits and vegetables. This results in a juice that retains all the vital nutrition you’re trying to squeeze out, as little to none is killed by heat in the process. Masticating juicers also make other delicious and nutritious items including nut butters, nut milks, fresh baby food, sorbets, pates, and sauces. Centrifugal juicers are quick, thus they produce heat that kills some of the nutrients that pass through them. Masticating, or cold press, juicers are slow, thus there is no heat build-up and no nutrients lost. Slow juicers also extract the juice without oxidizing it, which means the nutrients last longer—up to 72 hours in the fridge. If you want to go the extra mile, you can maintain even more nutrition when storing juice by using a vacuum seal of some kind. When referring to masticating juicers, people are generally talking about single gear (or auger) masticating juicers. Which quite literally means there is one central spinning gear that “chews up” the fruits and vegetables to release their juice. A Twin Gear juicer, on the other hand, has two gears to grind the juice from produce. If we rank centrifugal juicers as ‘good’ and single gear masticating juicers as ‘better’, then twin gear juicers would be considered the best. Twin gear juicers offer all the same benefits of single gear masticating juicers (i.e. cold pressed, minimal-to-no oxidation, versatility, dryer pulp, and more juice). However, twin gear juicers do it even better by virtue of having two gears to do the work instead of just one. In other words, they are the top-of-the-line juicers recommended for the person who knows they want to juice long-term and is ready to invest in a juicer that will last them for many years to come. Below, we’ll feature the six best single gear masticating juicers, then the best twin gear juicers, as well a premium two-stage hydraulic cold press juicer. All of the following masticating juicers are great machines; they are listed from lowest price to highest price and include helpful information to help you choose the right juicer for you. This compact juicer is a powerhouse. 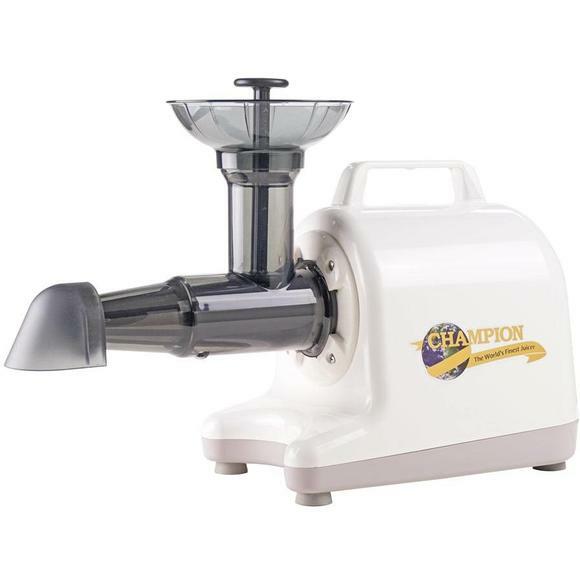 The Champion Elite 4000 is the upgraded version of the classic Champion 2000. It includes two different augers: one that’s designed specifically for juicing greens, while the other is designed for classic vegetables such as carrots, beets, celery, and more. The Champion Elite 4000 is made in the USA and built for continuous use. This machine is perfect for juicing all types of fruits and vegetables, as well as for creating nut butters, frozen fruit smoothies, soups, and sauces. As one of the most affordable masticating juicers, expect faster juicing and a wetter pulp; however, the juice will still be extremely high quality. For making sorbets from frozen fruit, there’s no better machine to get the perfect consistency. With a 47 RPM motor, this juicer is the "slow star" of the show. It employs a duo-blade auger, which increases the overall juice yield and produces a dryer pulp. The Tribest Slowstar SW-2000 is 100% BPA free, and it includes a stainless steel mesh strainer for removing any additional pulp from the juice. The homogenizing attachment allows you to make sorbets, nut butters, pates, salsas, and sauces as well. This is also a vertical juicer, which means that while it is designed to juice leafy greens, it’s ideal to juice them alongside a variety of other vegetables such as carrots and celery. Vertical juicers also take up less counter space, if that’s a concern. This is the perfect middle-budget vertical slow juicer for the juicing enthusiast. 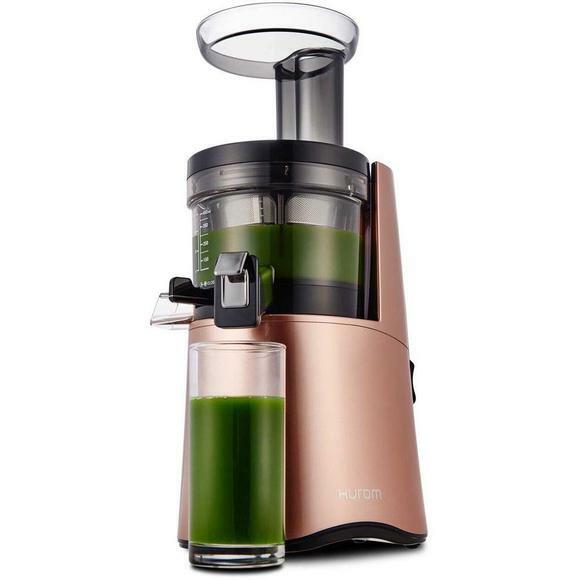 The Hurom Alpha H-AA Vertical Slow Juicer is ideal for extracting optimal amounts of juice with very little oxidation in the process.It’s also a quiet machine compared to many other juicers, and the clear encasing allows you to see the full process as it happens. It’s designed to produce a high yield of juice then be easily cleaned when you’re done. The Hurom Alpha H-AA is perfect for juicing various types of fruits and vegetables, as well as for making sorbets. If you’re planning to juice mostly leafy greens, consider a horizontal juicer instead. However, if you juice a wide variety of fruits and vegetables, the Hurom Alpha H-AA is an powerful slow juicer designed to produce dry pulp and highly nutritious juice. The Kuvings Whole Slow B6000 Masticating Juicer has a wide mouth for significantly reduced prep time when making juices. At only 60 RPM, this juicer is wonderfully slow, preserving all the nutrients and enzymes. 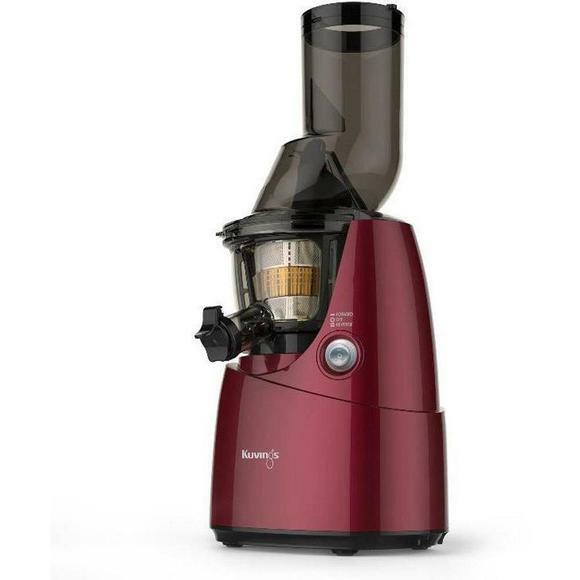 The Kuvings B6000 is adept at juicing all types of fruits and vegetables, and it comes with an extra attachment for making sorbets, salsas, and more. The Kuvings B6000 provides high juice yields, has a very quiet motor, and comes with a 10-year warranty. This is a vertical juicer, which makes it perfect for those who juice a range of fruits and vegetables. The Kuvings B6000 also includes a special brush tool for easily cleaning the strainer. This is an older model from Kuvings, allowing you to obtain an extremely high-quality machine at a much lower price. This top-of-the-line stainless steel Omega Juicer is the ultimate in multi-purpose juicers. Not only does it have extra attachments for creating baby food, nut butters and milks, pasta, sorbet, and more, it includes a storage case to house those components. And of course, it’s a fantastic juicer for getting the most from leafy greens, wheatgrass, fruits, and vegetables. The Omega NC900HDSS has five adjustable pressure settings and operates at a low speed, which is perfect for retaining optimal nutrition. The Omega Nutrition Center NC900HDSS is an incredibly efficient machine that’s able to produce high juice yields, saving you money on produce. The Kuvings EVO820 is the latest from Kuvings. It’s the upgraded version of the previous model C7000, and this machine is powerful. Its wide mouth saves you time as fruits and vegetables need minimal chopping. It’s partially self-cleaning: run water through the machine when your done and the main components will be nearly good to go. The Kuvings EVO820 comes with extra attachments for creating fresh delicious sorbets, smoothies, salsas, sauces, and more. If you’re ready to invest in a top-of-the-line single auger juicer that’s capable of creating a wide range of healthy items, you’d be cold pressed to find a better option than the Kuvings EVO820. The Tribest Greenstar Elite GSE-5000 has a three-stage juicing process with twin gears for optimum juice extraction and nutrient preservation. It’s the original twin gear juicer with patented technology for both breaking down fruits and vegetables and for maintaining the freshness of juice for longer periods of time. The Tribest Greenstar Elite GSE-5000 is ideal for juicing all kinds of produce, including hard root vegetables, leafy greens, and soft fruits. The Tribest Greenstar Elite GSE-5000 has an internal strainer that’s finely meshed, which results in less pulp in the final juice product. 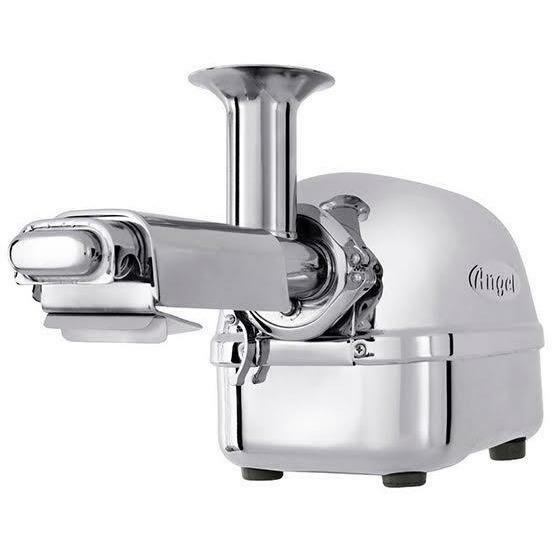 It includes separate attachments for grinding and one for creating nut butters, sorbets, and more. 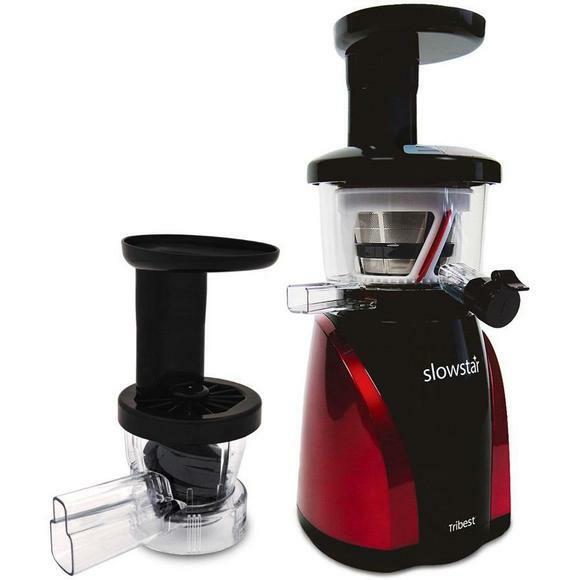 This juicer also has different pressure knobs: one to ensure every last drop of juice is extracted and another knob for creating items with a smooth consistency. The Tribest Greenstar Elite GSE-5000 also includes a 12-year warranty. If you’re ready to invest in an extremely high-quality twin juicer but can’t quite afford the Super Angel (described below), then this is by-far the best option available. It’s been on the market for years and is considered one of the best masticating juicers money can buy. The Super Angel Twin Gear Juicer is available in four different models at various price points: The Super Angel Plus, Pro, Deluxe, and Premium Deluxe. The Super Angel Deluxe model is our personal favorite at Extreme Wellness Supply, but we’ll go over what makes each model unique below so you can decide which is your favorite. But first, what are some of the things all of the Super Angel models have in common? This model includes the manual reverse function; should you accidentally overload the Super Angel, it’s easy to turn on the reverse function, release the produce, then move it forward to grind them into juice. This model has an automatic anti-jamming function, which detects an overload of produce and self-adjusts the speed control. It also has an automatic reverse function that clears any accidental blockages. The Super Angel Deluxe includes everything the Super Angel Pro does, as well as the Soft Fruit attachment, which is perfect for juicing citrus, grapes, strawberries, cucumbers and tomatoes. It also allows more pulp through for the perfect fresh cup of orange juice. This is also our favorite model of the four. The Super Angel Premium Deluxe is the ultimate in top-tier juicers. 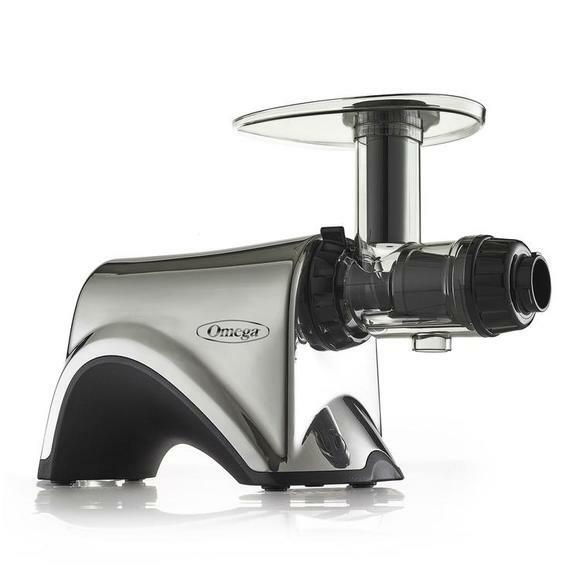 This juicer includes everything from the Super Angel Deluxe; but its primary parts and standard extracting-screen housing are made of surgical-grade stainless steel, which lends to extreme corrosion resistance and provides the highest level of hygiene. The rest of the machine is made of the same food-grade stainless steel as previous models. Which model you choose is entirely up to your needs and preferences. Overall, the Super Angel’s extraction process creates the highest quality juice imaginable. The resulting pulp is incredibly dry, while the produced juice is vibrant and rich in nutrients and enzymes. Check out our Super Angel product reviews to see just how highly beloved this juicer truly is. This juicer is in a league of its own, comparable only to other two-stage hydraulic cold press juicers. So what does it mean for a juicer to have two stages? Most home juicers are single stage, meaning produce goes through the machine and the juice is extracted. 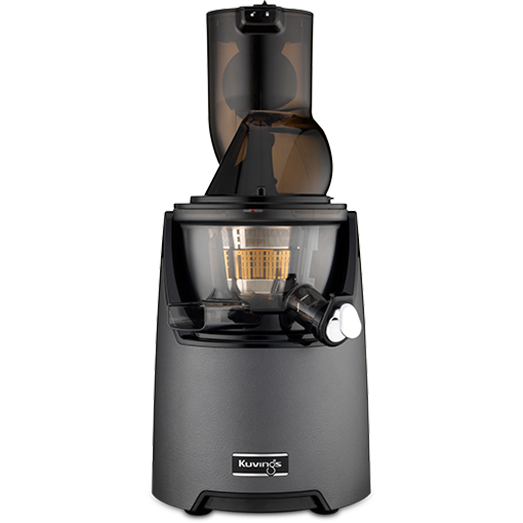 However, a two stage juicer separates the grinding and juicing step to give you the highest quality juice. In the first stage, the juicer grinds the fruits and vegetables into a mash. It’s highly beneficial to have all of your fruits and vegetables in this mash, as there are certain processes that happen amongst some vegetables that yield even better enzymes and nutrients when they come in contact. The second stage uses the hydraulic press; here, you put the mash onto a (included) mesh screen that’s then placed on the hydraulic press. Then you turn on the press and it squeezes every last ounce of juice out, so much so that you end up with a brick of dry pulp! There are other two-stage hydraulic cold press juicers on the market but The Pure Juicer is the most technologically advanced juicer. The designer of this juicer repaired hydraulic cold press juicers for many years before creating his own: The Pure Juicer. This machine comes with eight different screen trays (that slide easily into place) for use in stage one; these various screens are meant to be used for varying types of produce from carrots to greens, as well as for grinding coffee, creating fluffy sorbets, and more. The Pure Juicer meets all commercial standards for juicers, yet it’s designed for your kitchen at home. It comes with a 12-year warranty, has all dishwasher safe stainless steel components, and is capable of performing stage one and stage two at the same time in order to save you time. There’s no doubt that this is an investment but we consider it the investment of a lifetime. Have a question about any of the juicers above? Leave a comment below! Or, let us know which one you’re choosing; we’d love to hear from you!